Wichita-based Occidental Management expects to close on the Sprint Campus in the next 30 days. CEO Gary Oborny and President Chad Stafford talked with MetroWire Media about what led to the acquisition and plans for the sprawling Overland Park campus and adjacent land. MWM: When did you first become interested in buying the Sprint campus? Oborny: We heard that Sprint was looking at divesting at some point, so we started following opportunities to get closer to the situation and look at how we might connect on a potential deal. We sat back while Sprint figured out what to do. Then we contacted Cushman & Wakefield when the property was placed with them for a national search last year. MWM: How did your 2014 purchase of the former Overland Park International Trade Center (OPx) adjacent to the Sprint campus play into the acquisition? Oborny: OPx was our introduction into the market. It helped us build relationships in Kansas City and Overland Park, so the Sprint campus was a natural fit. MWM: What is your short-term game plan for the campus? Oborny: We want to enhance existing amenities and bring additional amenities for tenants who want to be on the campus. There are a number of cafeterias and food venues, so we will look at bringing in guest chefs and maybe freshening those spaces. We’re also looking at conceptual ideas to improve the overall aesthetics of the campus, so we will be look at revitalizing existing buildings to make them a little more contemporary... Eventually we’ll undergo a full rebrand of the campus. MWM: What will Sprint’s ongoing presence be? Stafford: Sprint will continue to be the largest tenant, and the company is making a commitment to Kansas City with a long-term lease situation, but that’s all we can say right now. Sprint and Occidental are both focused on recruitment and retention of associates and employees on the campus. MWM: What is the current tenant mix and how do you see that changing? Stafford: There’s a good mix right now between health care and financial services companies. There is also good infrastructure for technology-related companies, so there is opportunity there. MWM: What additional opportunities do you see? Oborny: We are looking at the 60 acres near 119th and Nall that have never been opened to commercial development. We see an opportunity to bring amenities to that vacant land such as hotel, restaurants and retail, but for right now we have to close. MWM: This is a huge transaction. What’s next for Occidental? Oborny: Yes, it’s a big opportunity. We see a natural progression for us in Midwest cities, so development opportunities in the $100-$300 million range are certainly always of interest. Wichita-based Vantage Point Properties has entered the Kansas City market, announcing plans to develop Reflections at City Center, a sprawling Class A office complex in Lenexa. "Our vision is to create an environment that is both aesthetically and functionally different from any other office park in the Kansas City area," said Paul Jackson, president and founder of Vantage Point Properties. "Every detail - walkable paths, architectural lighting, and sculptures - will come together to create a comfortable, enjoyable place to work." The commercial real estate company just closed on 32 acres at I-435 and Renner Road and envisions a walkable, upscale 315,000-square foot campus featuring reflection pools and three restaurants. The Lenexa City Council has approved tax increment financing for the project, which will break ground pending identification of an anchor tenant. "The project will provide a unique opportunity for a company to come in and make the site their own," Jackson said. "They will really be able to create their own footprint here. We're ready to make a deal happen with the right partner." Jackson, who co-founded Vantage Point Properties in 1992, sees opportunity in the relatively stable Kansas City market. "It has a track record of steady growth," Jackson said. "And Lenexa is the perfect spot for our first project." Matt Stover and Tracy Wilson of Colliers are marketing the property for lease. Food ingredient research company Corbion has opened its new 58,000-square foot North American headquarters and advanced laboratory facility at 8250 Flint St. in Lenexa. The new $13 million facility consolidates the company's 200 employees into one regional operation. Developed by Block Real Estate Services (BRES), the building is less than a mile from Corbion's longtime location at 79th and Quivira and marks the completion of Pine Ridge West Business Park, a flagship development for BRES. The facility includes a state-of-the-art bakery and demonstration kitchen, as well as meat research and application labs. Designed by Finkle + Williams, the building reflects the company's focus on sustainability through local sourcing, clean energy, centralized waste management, composting and recycling programs, according to a release. The new headquarters and lab will inform the Dutch company's approach to helping create a safe and sustainable global food supply. Corbion has had a presence in the KC region for almost a century. Local vendors were chosen for the facility, including food services by Westport Flea Market and beverages by Messenger Coffee and Tea Market. Block added that Corbion was a good partner for BRES because the companies are aligned both professionally and philanthropically. “Corbion’s involvement in the community and focus on giving back align with BRES’s commitment to philanthropy which has made this an ideal partnership,” Block said. Corbion employs a total of 350 in the region. Downtown Lee’s Summit officially joins the coworking movement with the Wednesday opening of Bridge Space, a 14,000-square foot redevelopment of the city’s historic U.S. Post Office. Bridge Space includes 34 private offices, 12 dedicated desks, 6 state-of-the-art conference rooms, and 3,000-square feet of open coworking space, as well as a 2,000-square foot event space with mezzanine and balcony. Longtime Downtown Lee’s Summit resident and serial entrepreneur Ben Rao led and championed the redevelopment effort, which involved the arduous process of securing a spot on the national historic registry. Rao envisioned a startup facility that would attract economic development in Lee’s Summit by encouraging companies to incubate businesses in their hometown. It’s a concept that Lee’s Summit Economic Development Council President Rick McDowell agreed is much needed. “This is really an economic development play- completely- to the point that I’m getting calls from other cities. They want to talk about how we did this in Downtown Lee’s Summit,” Rao said. Bridge Space amenities include a member lounge, large kitchen, café area with free coffee for members. Conference rooms are loaded with 55-inch 4K TVs and multiple hardwire and internet connections. More than 500 people registered in advance to attend Bridge Space’s grand opening Wednesday night. 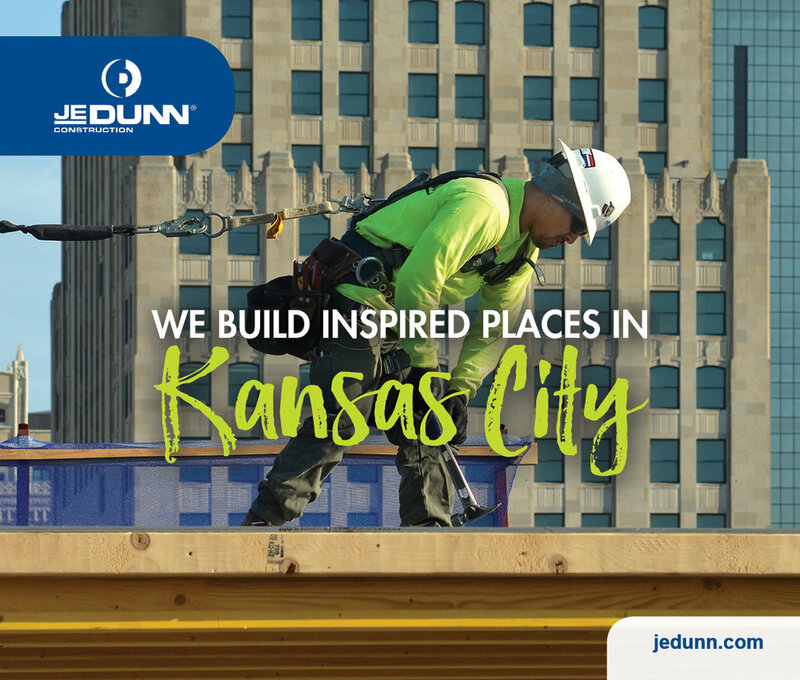 Burns & McDonnell will build a 142,000-square foot office building and 550-stall parking garage at its Kansas City World Headquarters, a $42 million expansion that will complete the engineering firm’s local campus and grow local employee capacity by 22 percent. 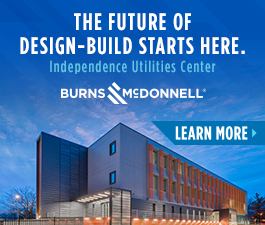 Targeted for completion in 2020, Burns & McDonnell will use an integrated design-build approach for the four-story building. VanTrust Real Estate will provide development services for the project, which will be constructed between the existing 9400 Ward Parkway office building and the campus’ parking garage along 95th Street. The new building will primarily include additional employee work stations and conference rooms, adding 780 spots and bringing the campus’ potential headcount to 4,300, according to Brittney Swartz, Burns & McDonnell design project manager. Sustainability will be a priority, with additional charging stations and a high-tech shade system allowing for energy efficiency through daylight “harvesting.” Conference rooms will have integrated technology and camera systems allowing for quicker, smart meetings with clients across the globe. Rapid growth in the energy and power transmission markets, as well as public infrastructure, are driving demand for space and creating a race against the clock. “We will have space problems between now and the opening of the new building,” Kowalik said.